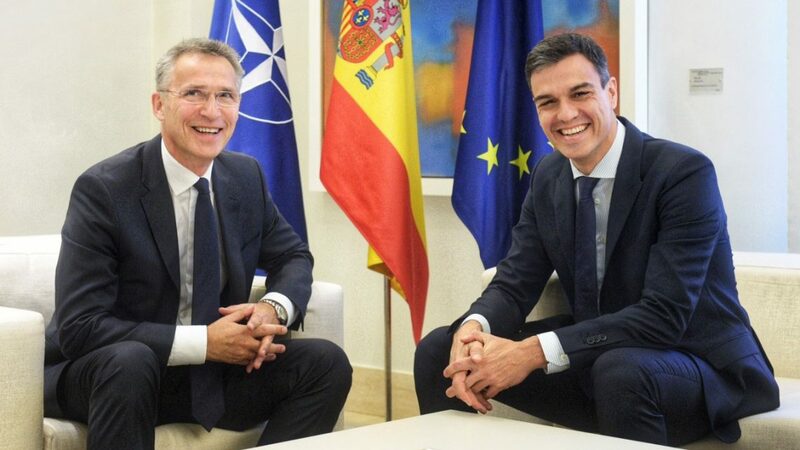 Mr. Stoltenberg and Prime Minister Sánchez discussed the Summit in Brussels, where NATO leaders will take decisions to further strengthen the Alliance, increasing the readiness of Allied forces, improving NATO’s command structure and strengthening NATO-EU cooperation. The Secretary General stressed that NATO will do even more to combat terrorism, with continued commitments to Afghanistan and a new training mission in Iraq. He said that the Alliance’s efforts to stabilise partners can also help to alleviate the refugee and migrant crisis in Europe, mentioning also NATO’s deployment in the Aegean Sea and the support that NATO’s Operation Sea Guardian provides to the EU’s Operation Sophia in the Mediterranean. They also discussed fair burden-sharing ‎within the Alliance, which will be an important topic at the NATO Summit. The Secretary General noted that Spain has stopped the cuts to defence spending and started to increase, stressing at the same time that all Allies have to do more. He also commended Spain for investing in modern capabilities and making significant contributions to NATO missions and operations. Mr. Stoltenberg thanked Spain for its contributions to the Alliance’s shared security, including participation in a NATO battlegroup in Latvia and in NATO’s Air Policing mission in the Baltics; as well as for contributions to NATO’s training efforts in Afghanistan and in Iraq. Mr. Stoltenberg said that Spain continues to play a vital role in the Alliance also by hosting missile defence ships in Rota and by having a Patriot battery in Turkey, helping to protect against missile threats from Syria.